Metropolitan life is busy and full of pressure will make a lot of stress workers. They started looking for an outlet for refreshing and soothing heart mind for a moment. They began looking for a quiet nature and cool but without having to pay an expensive ticket. This vast city of Jakarta has many suburban areas are still cool and calm. In addition, cheap natural attractions available in this metropolitan city is also quite a lot. Here are some inexpensive natural attractions that can make your mind calm around Jakarta. 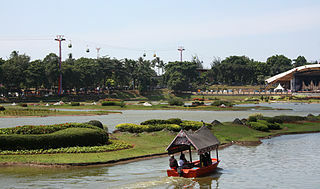 The lake is located on the outskirts of Jakarta, is included in the region of Lenteng Agung, South Jakarta. If you are walking from the direction of Depok, the Lenteng Agung around the station you will find the road signage towards Setu Babakan. You will easily find this place and the location of the lake is not far from Muhammadiyah campus. Setu Babakan entrance gate with a traditional Betawi house roof forms are usually called by the name of Bang Pitung, one of the heroes of old Batavia. Once you get into the area Setu Babakan, will be seen by the roadside houses with traditional ornament Betawi, such as roofs and terraces form. If you visit this place on the weekend and national holiday, you can enjoy traditional Betawi art performances, such as xylophone kromong, lenong, harp, and other attractions. you can see the show schedule posted on the wall of the counter inside. After tired of walking, you can relax by the lake while enjoying a variety of foods and beverages such as egg crust traditional Betawi, soto Betawi, beer pletok, and starfruit juice. If you want to play in the lake, you can rent water bicycle. For those of you who came with a group or groups, you can join the cultural tour packages. Package provided varied and thick with atmosphere Betawi. The group participated this package will be greeted with a welcome dance to the accompaniment of Betel Yellow xylophone kromong. Then relax in nyiahi session, namely the tradition of drinking tea and snacks at a time Betawi between morning and afternoon or often referred to brunch. Tourism can continue to house residents to learn how to make a dodol (lunkhead), kerak telor (egg crust), and pletok beer. You are advised to come to the Setu Babakan in July and August, because usually it is often held in Setu Babakan festival. All the unique things that exist in this lake will be brought to complete. Dik Doank was the originator of the village park. He is a well-known presenter who frequently appeared on various television shows in Indonesia. In addition to being a presenter, it turns out he is very concerned with the world of children and education. Dik Doank concern that embodies opening playground named Kandank Jurank Doank. With the concept of back to nature. Children and adults can play and learn in the green rice fields and beautiful village environment. Kandank Jurank Doank fairly easy to find, from Jakarta, you can skip to the Serpong toll Simatupang, then exit at the Ciputat toll booth, and follow the great road to meet with the board yellow KDJ instructions before elementary school. Natural attractions opened to individuals on weekend and public holidays, and individual participants can enjoy only the outbound packets only. On regular days, tour packages for group bookings of at least 50 people. Individual outbound package offered already includes a flying fox that lies in between the trees and the river flows. There are also bamboo rocking, VH bamboo, bamboo branches, climbing up the rope. The most exciting game play here is the shucks boat. Group participants will race down the river currents using rubber tires boat. Group tour packages better. Inside this package, participants are invited to hiking, walking in the rice field, and then learn how to farm from seed to cultivation, as well as buffalo bathing and fishing. Another activity that can be done is to paint T-shirts, pencil painting, and making works of clay. If you just want to relax, you also can visit the Museum of Work Library. In this museum you can see a gallery of Dik Doank collection of belongings or just read a variety of books in the library. Eat chicken pecel and relax while enjoying views of the village and rice field also exciting. Have you ever heard the name of this place? if not then you are lucky enough. Tanah Tingal could be an alternative interesting sights because in addition there are facilities for outbound, tourists can learn orchid cultivation, planting rice, making compost, playing in the lake, and swimming. Upon entering the gate, visitors will be presented with a view that is cool and very beautiful. Outbound facilities available in the country is quite complete attraction like elvis walk, flying fox, Burma bridge, monkey walk, and others. Flying fox trails in this place is also unique in that it passes through the trees high enough. Gliding through the trees will make you like tarzan. Outbound activity also does not end there. If you happen to come with friends, travelers can play futsal in the provided field. You can also enjoy adventure in an artificial lake with ducks, geese, and various birds that fly freely roam in a small island located in the middle of the lake. You only pay Rp.25.000 to wade through the lake using a canoe for 15 minutes. The canoe can only carry two people so it takes extra energy to be able to pedal. Having tired of playing all day, you can relax while learning about plants. You can learn about, planting, and caring for plants. Travelers also taught how to plant and harvest rice, making compost, as well as the cultivation of orchids. In this place you can learn to form clay and learn to make batik. You want to play again after learning, try to rent a bike to get around the surrounding area tingal Land with an area of ​​more than three acres. Rp.5000 pay enough to be cycling for 30 minutes. While traveling you can see and recognize a variety of plants for each phon given nameplate. Tanah Tingal owned plant collections including endangered species and rarely seen. Tanah Tingal actually created for outbound activities and training groups. Tanah Tingal opened to the public on weekends and public holidays when there was no activity or group of companies or government agencies. We recommend that you call first before visiting this place. Tanah Tingal Address: Jl Merpati Raya KM 328, Ciputat Jombang, Tangerang, The price of admission: 15,000 (not including training costs), Schedule: Monday – Friday (training group only) 9:00 to 15:00, Saturday – Sunday and National Holidays 09:00 to 15:00. The place is not hard to find. from UIN, you will see the sign hints towards Situ Ginting. Just follow the path that will lead to this place. 25-acre natural lake adds to the list of places that provide outbound exciting here. The package price is quite various according to participant wants. Outbound programs are divided into three groups, namely adolescents, adults, and the company, as well as children. Each program aims to foster self-confidence and cohesiveness so that it can form a good character. In addition to playing in groups, participants also provided a variety of different attractions such as the individual challenges marina bridge, suspension bridge, flying fox, elvis walk, swing Burma, Burma bridge, single dolken walk, happy hooper, walk-climbing, and a double rope. The game is also combined with water games such as water fishing activities and science for children. Although located on the outskirts of Jakarta, cool atmosphere is very pronounced at this location. old trees and coconut grove make the body will not feel tired. If you want to enjoy the beauty of the lake, you can explore lake ini water traveled by boat or water bike tour. Other facilities are paint ball arena. Pulau Situ Gintung also provides a camping ground for the night and feel the sensation of living in the wild.